Plus Size Kitten: Redeem REN Trial Kits for Free! I saw Pinky's blog she shout out on the Ren's freebies from www.askcleo.com.my (which I am a member as well! go sign up for free there!). The promotion is about REN (clean bio active skincare). They're giving away free trial kit if you print out the voucher below for redemption. No RSVP needed. 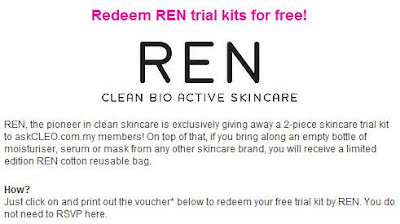 Also if you bring along an empty bottle of moisturizer, serum or mask from any skincare brand, you will receive a limited edition REN cotton reusable bag. cool.. wait i free i go redeem.. I went to MV collect mine last Tuesday :( they have not much stock left too.